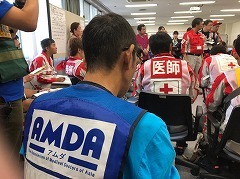 The two AMDA coordinators began a field survey of medical needs in the affected areas on 11th September. After visiting the Abiracho Town Hall, they participated in a meeting with an administrative group of various medical institutions that is active in Abiracho, Atsumacho and Mukawacho. Additionally, it was decided that two more nurses are to be dispatched – one on 12th and the other on 14th September. As of 12:00pm on 12th September, there are 1,590 evacuees in Hokkaido Prefecture, more than 80% of whom are within the three previously mentioned towns. The vast majority of households in Atsumacho and more than half of households in Abiracho have no running water.